Parody was completely lost on me as a kid and teen. My friends got it. Hollywood seemed to understand it. MAD Magazine sold like hotcakes. I, on the other hand, didn’t even crack a smile and had no clue as to why it seemed funny. I’ve grown since then as has my appreciation and enjoyment of parody. I get it now, maybe because I now allow myself to see slap stick stupidity as a viable and even intelligent form of entertainment. 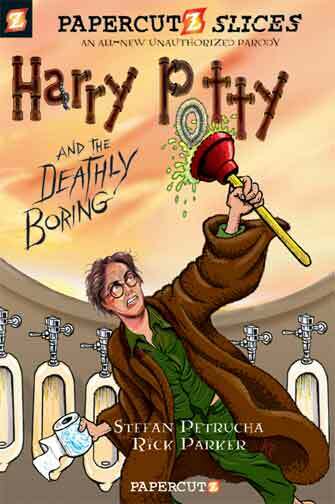 I enthusiastically awaited HARRY POTTY AND THE DEATHLY BORING and WICKEDER from Papercutz. Being a Potter fan I took on the wizarding world (Harry Potty, Don Measley, Whiny Stranger, and Dumb-as-a-Door) on first. The goal was to find the Horbucks and destroy Valuemart. I found it a bit obscure at times and underwhelmingly comical in most places. HARRY POTTY took me some time to get through, which made me worried about WICKEDER. My concern was unnecessary. TALES FROM THE CRYPT: WICKEDER … AND HIS LITTLE DOG TOO was a riot. The tri-story format worked better for me. Parodies gone too long find themselves lurching and gasping to stay funny. The TALES FROM THE CRYPT series always has three chapters per title –– no worries about overstaying one’s welcome. The Crypt-Keeper, Stinky Dead Kid, and all the Wizard of Oz characters made for a great book. 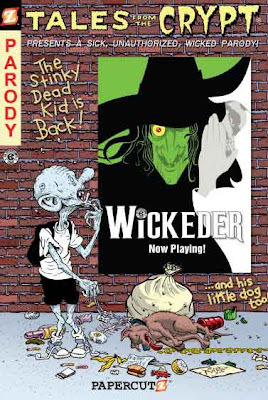 In Dead Dog Dies The Stinky Dead Kid comes back with a zombie dog story much better than his debut title. Kill Baby Kill is wartime, political commentary that has some things to say. Wickeder is the final chapter that comes locked and loaded with oppressed munchkins, a court proceeding, three flying monkey judges, and a less-than-cordial ruby-slippered Kansan. 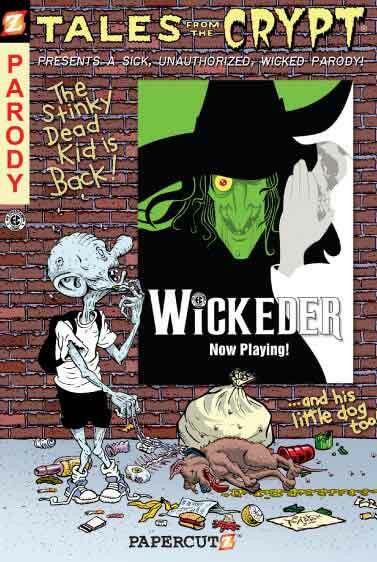 Start to finish WICKEDER is a page turning of parody-filled fun. Maybe I just missed HARRY POTTY. Like I said in the beginning, I have not always enjoyed parody. Perhaps it’s me and not the book. For me WICKEDER is the title to read. I think I might require parental permission for students under 10, but only as a precaution. There are zombies, dead creatures, bathroom humor and other things that make kids laugh. The thing about parodies is that they require intelligence and experience to understand. Readers must be able to make connections to pop culture, literature, politics, and the like to get the jokes. This means students must read for content and look for hints and clues and references – deeper meanings. Because it is a parody, students will enjoy the experience while learning how to make connections and reading for deeper content.